Prope-developed Digimon fighting game due out this fall. Bandai Namco has announced Digimon All-Star Rumble, a new Digimon fighting game coming to PlayStation 3 and Xbox 360 on November 11 in North America and this fall in Europe. In development at Prope, which made the PSP Digimon Adventure game, All-Star Rumble is a party-arena multiplayer game. The story begins when the Digital World is in a time of restored peace after overcoming numerous wars and crises. However, as Digimon must battle to Digivolve, the Digimon propose a “Digimon Evolution Tournament” to determine the world’s strongest fighter. The game features 12 playable base Digimon and a total of 32 Digimon forms after Digivolution, ranging from Digimon between Digimon Adventure to the more recent Digimon Fusion. There are 10 different battle arenas, and players can collect DigiCards to power-up their Digimon. Eight base Digimon have currently been confirmed: Agumon, Biyomon, Dorulumon, Gabumon, Gatomon, Shoutmon, Tentomon, and Veemon. Get the debut trailer and a fact sheet below. View the first screenshots at the gallery. Jam-packed with an all-star cast from the Digimon Universe, Digimon All-Star Rumble throws down with immersive 3D battle arenas and high-impact, in-your-face fighting action. The incredible defenders of the Digital World have grown bored and peace brings no satisfaction. A world without chaos has extinguished the driving force behind their existence – to Digivolve. To pacify the growing unrest, a proposal was made… “Let us gather all Digimon who seek to Digivolve and hold a tournament to crown the strongest of them all!” And so began, the “Digimon Evolution Tournament.” A tournament of Digi-monumental proportions. 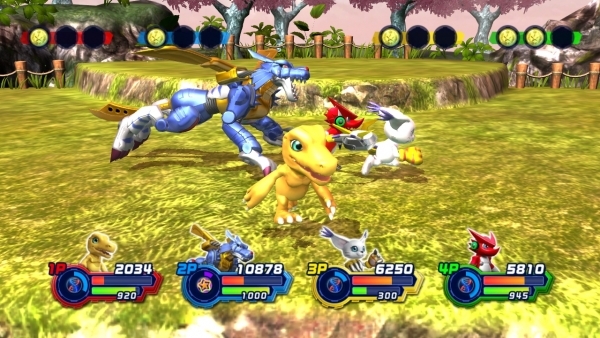 All-Star Cast – Digimon All-Star Rumble features an all-star cast of characters, each with their own unique fighting style and moves. Choose from 12 of your all-time favorite characters from the Digimon Universe spanning from Digimon Adventure to Digimon Fusion. Digivolve to unlock advanced forms! All New Story – Digimon All-Star Rumble features an in-depth campaign mode where players can explore the Digital World through 3D stages. Your ultimate goal is to battle your way to the top of the Digi-Rankings! Digi-destined to Digivolve! – Power up and Digivolve to gain advantage over your opponents and deal massive damage! Fun for All Ages – Easy pick-up-and-play controls for beginners. 10 Different Battle Arenas – Throw down in stages pulled straight from the Digimon Universe! DigiCards – Collect DigiCards to enhance and strengthen your Digimon in battle!